This Details Installation of my Autometer 2 5/8 Boost Gauge. First thing to do is to put the Pod up on the A pillar to see exactly where you want it. Use something to mark where you want it(I used a piece of tape. Next, remove the A-Pillar. Remove the screws on the A pillar, Remove the screws on the speaker grill and remove the grill. Next I just pulled on the trim pannel that runs over the door to remove so I could get the A pillar out. I then began by drilling a enlarging a hold in the A pillar so the lines to the boost gauge could run through. The hole only needs to be a 1/2"
I then drilled holes for the push screws supplied with the Autometer gauge pod and went ahead and mounted the pod(but not the gauge). Next I ran the boost tubing into the engine bay from the interior. I used the hole that is in the very back drivers side corner of the engine bay(see pic below). I also ran 12+ and - to the A pillar area.. I then re installed the A pillar pod, Speaker Grill, and the trim. I made sure I ran the wires and tubing into the A pillar pod before installing the screws to hold the trim and speaker grill. I hooked up 12V + and - and the boost tubing to the boost gauge. 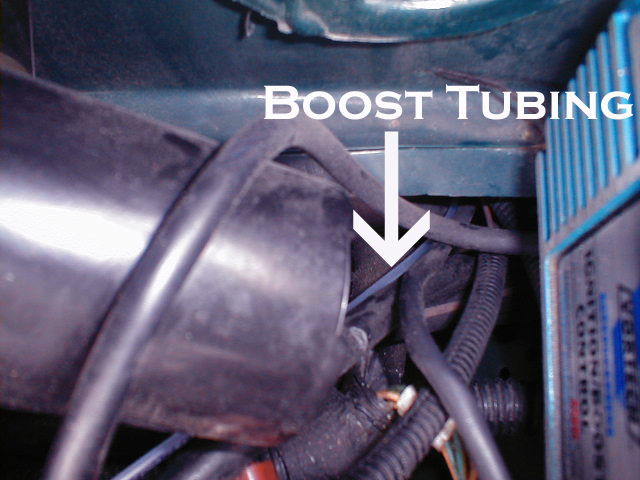 On the engine side of the boost tubing, I used a 5/16" T fitting and tapped into the S/C vaccum hose. 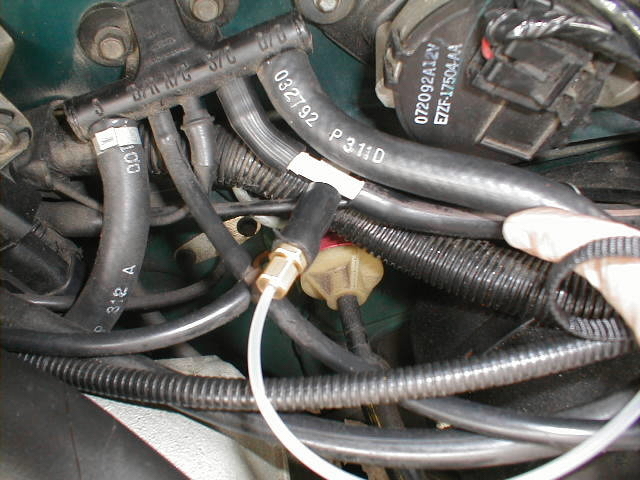 I cut about 1"(use your own judgement on how much you need and can get away with) off the end of the S/C stock vaccum hose so I could hook the Boost tubing to the T. But it was okay that I cut, because the T makes up for that loss(See Pic). All comments/instruction given off this website to be taken with a grain of salt and website owner/builder not responsible if you break something on your own car or whatever..